Thanks to the internet, Lilly’s story being heard! In the past few months there has been some sightings of Lilly. Unfortunately, they have not been confirmed. We do not know for sure that it is her or a look alike. It’s very frustrating to say the least. And extremely difficult for her mother. For those reading my blog for the first time, please read on and let me tell you about Lilly. Lilly vanished June 2, 2007. You may not have heard as most locally haven’t because she’s never been on the news! As you can see, we depend on the internet to spread the news about Lilly. Here is a recent article written about her. We are currently organizing an event for the year anniversary of Lilly’s disappearance. If anyone would like to help with this please contact us. Unfortunately, we don’t have much support from the community right now. Probably because no one knows. That’s why we’re asking for your assistance. We need people to help post and distribute flyers all around Florida. This can be done any time at your own convenience. If you’re a truck driver and are thinking about lending a hand contact me today. Every one is encouraged to help. We also need a spokesperson for the family. Another thing that would be of great benefit is to write letters to local media, newspapers and politicians. Unfortunately, people go missing every day and not enough media coverage or importance is given. Even police complain about media and their lack of coverage of cases involving missing or abducted children. It’s all too common. 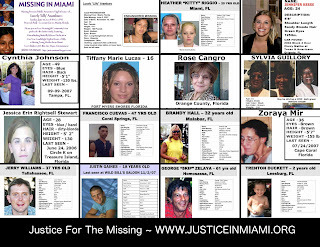 Below is the official police missing person report written on June 2, 2007, 24 hours after Lilly Aramburo mysteriously disappeared from her fiance’s apartment in Kendall. I wish Miami Dade Police would investigate her disappearance. Her family and friends need answers. She is in serious danger and must be found. Please help!